We got excited and we decided to build our own Asset Store:) Initial plans are here. While it’s being created, I suggest we upload models to opengameart.org and mark them by placing [cge] in the title. This way we can build the content for our asset store today 🙂 We have a persistent link to all models marked [cge], make sure your models appear there. The point of the models tagged with [cge] (and later in our asset store) is to be available in formats that Castle Game Engine can handle. Like X3D, castle-anim-frames, Spine JSON. See the exporting documentation about how to export from various software. Of course, just like all opengameart.org submissions, the assets must also be clearly marked with an open-source license. 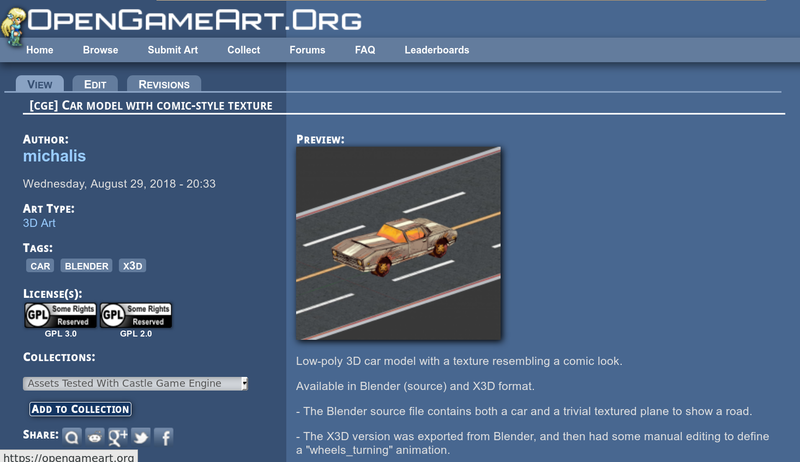 And, like all opengameart.org assets, you are strongly encouraged (but not required) to upload also a “source” model version (in Blender, Spine etc. ), to allow people creating derivative works from it. It is best to test your models in view3dscene (you can use stable view3dscene version, or view3dscene snapshots from the latest GitHub code). Run the animations to see they are OK too, using menu item Animation -> Named Animations (this calls the familiar method PlayAnimation in CGE). Next PostNext Castle Game Engine Editor!